» Air purifiers – A clean job! Air purifiers – A clean job! Air purifiers, neat and tidy! Filtered, clean air in rooms without windows is important for mental and physical well-being. People suffering from allergies rely on controlled, precisely adjusted conditions. Our electric air cleaners are able to achieve a purification rate of as much as 99.9% with a fully automated operation – not only allergens, but also odour and bacteria are captured. What can air cleaners do? Exhaust fumes from vehicles and factory fumes have significantly reduced the quality of breathing air over the last decades. In rooms without windows countless of these pollutants accumulate. Occasionally, their concentration inside the house is much higher than outside the building. Researchers have found out that indoor air contains a 100 times more pollutants in severe cases! Respiratory disease, allergies and asthma are only some of the effects polluted air has on us. Tobacco and cigarette smoke are particularly harmful sources along with allergy-triggering dust, contaminants and chemicals such as mould, germs and bacteria. Pollen and animal hair from dogs or cats make it difficult for people with allergies to perform everyday tasks, they can even worsen the disease. On top of problems with breathing, headache, impaired concentration and fatigue occur oftentimes. Treating the direct symptoms only produce temporary relief. The discomfort tend to resurface if the air quality remains at the same (bad) level. In the long run it is much more efficient to remove the cause: Nowadays, state-of-the-art technology offers many different ways to clean indoor air from unwanted contents. It does not matter whether the room is equipped with a ventilation system that brings in fresh air or not, air cleaners handle stale and fresh air likewise. Keep in mind though that air purifiers do not replace the need for sufficient air supply because oxygen that has been used cannot be recovered. Not only polluting particles but also high contents of CO2 negatively impact the well-being. Stop allergies now! With the Vornado AC300 by your side. Purifying devices are equipped with super fine filter systems and react automatically to the degree of pollution if the unit has an integrated sensor. They remove pollutants such as household dust, mites, bacteria, germs, gas, but also all other particles that could potentially cause discomfort. Air purifiers also neutralise odours such as persistent cigarette smoke. Originally, filter systems were used in the fields of aerospace, medicine, research and every place with special requirements for clean air. They delivered outstanding results and have been used in residential areas ever since. It does not take long before the effect of an air purifier becomes noticeable, users begin to feel better soon after setting the device up which shows you just how polluted the air surrounding us really is. The "Clean Air Delivery Rate" CADR rating for dust, pollen and smoke refers to the cleaning capacity of the appliance. The three values are stated individually because these particles vary in size. This gives you the chance to compare units with each other. Find out more about the CADR rating in our guide. Der Vornado AC300 True HEPA is suitable for small to medium-sized rooms, for all large spaces we recommend products from the Swiss Stadler Form range. Despite their efficiency the power consumption of the units is rather low: The Viktor is designed for use in rooms with up to 50m2 and requires 38 Watt on the highest setting, on the lowest setting this number decreases to 10 Watt. Robert, who services rooms with 80m2, is particularly eco-friendly and operates on 7-30 Watt! The AC300 air purifier runs on 1725 revolutions per minute and is able to remove as much as 99.97% of pollutants from the air. This unit uses up 105 Watt, however it is a real blessing for people suffering from allergies! Before you place your order, make sure your room does not exceed the recommended size. Particularly in wide areas such as restaurants you might need two or more devices to ensure efficient performance. Please also note that the purifiers in our range are not rated with special IP codes that ensure a special protection against water ingress by rain, splashing water, etc. High volumes of condensation as you might encounter in bathrooms and kitchens negatively impact the sensitive electronics. Please check the recommended fields of application in the respective item description and instruction manual. Air purifiers are mostly engineered for use in residential areas with low to medium contents of water vapour. They must not be used outdoors. In order to ensure efficiency of air purifiers it is necessary to check and clean or replace the filters on a regular basis. This is the only way to guarantee that the appliance is able to operate using its full capacity regardless of the texture of the pollutants. Some units automatically indicate if it is time to replace the filter. In order to maintain the right to exercise warranty claims and provide error-free functionality, please make sure to only use the original filters recommended by the manufacturer. Naturally they are part of our product line. The carbon filter for the Vornado air purifiers have a recommended replacement cycle of once a year because it traps odour, fine dust, hair, lint, etc., therefore its absorbing power decreases over the course of time. Essentially, it is the same principle as an old toothbrush: You could continue to use it but it just would not deliver good results. The activated carbon filters are budget-priced and exchanged within a matter of minutes – Try not to postpone the change unnecessarily. Behind the activated carbon filter the Vornado True HEPA filter for the AC300 catches microscopic particles (0.3 µm and bigger) like mould spores and even bacteria. This filter is also replaced every year. Two individual displays give you information about the replacement of the HEPA and carbon filter. 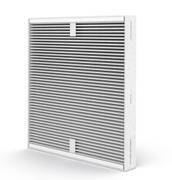 The light-coloured prefilter of the Stadler Form Viktor air purifier protects the device against coarse particles and optimises functionality of the sensitive inner parts. This robust filter should be replaced every 6 months and can be cleaned with a hoover in between replacements. The activated carbon filter cannot be cleaned or washed. Once it has reached its capacity limit it needs to be removed. Usually it is enough to replace it every 6 months. This filter comes with a little note to mark down the date for the replacement. We offer the original Viktor filters in our shop. If you notice that unpleasant odours are not absorbed sufficiently anymore, it might be necessary to replace the filter sooner than 6 months. The HPP filter traps germs and bacteria. The manufacturer recommends washing the system every two months with cold water. After the specified drying time it can be put back into the device. Each instruction manual will give you a detailed description of the replacement process. Replacing the filter is really easy and done within a matter of minutes. The Stadler Form air washer Robert operates by using a different technique: The air is sucked into a water quench (“washed“) that contains ionic silver. The silver removes tiny particles and kills bacteria. The water is disposed of after every cleaning cycle.